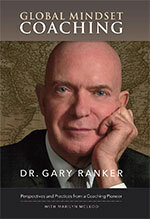 "Over the past 35 years, I have known and published many of the top consultants and executive coaches. More recently, at age 70, I have enjoyed being coached by a woman who has worked for 25 years with two of the top executive coaches, Marshall Goldsmith and Gary Ranker. Marilyn brings a wealth of experience and proven tools and methodology to her coaching, and then adds her own special touch, including her amazing empathy, her ability to ask the right questions and listen deeply to understand. She then explores options and draws out solutions, rather than simply prescribing canned remedies. Her one-on-one, customized and personalized coaching proves that she really cares about helping her clients make progress in areas that matter most to them in both the personal and professional domains of their lives. I highly recommend Marilyn McLeod, an executive coach who knows how to develop authentic leadership excellence." "I've known Marilyn for many years and hear only positive comments from individuals who know her and have worked with her. She is deeply experienced in a variety of industries, and on a variety of subjects critical to executive coaching." "Marilyn is a talented, smart, sincere and wonderful person! I have known Marilyn for many years in various roles. I have known her to be very intent on being of great value. She gives high service and support for her clients. She has helped me in a coaching role, in my book launch and in general networking connections. I highly recommend Marilyn for a role in working with leaders to get to the next level with projects or in their businesses." "Marilyn has an amazing and rare ability to recognize patterns of behaviour as a coach and distill that understanding into direct pragmatic recommended actions to improve her clients' interpersonal relationships. The result is that her coaching clients are more successful in both understanding themselves, more self aware, and are able to achieve their goals within business more efficiently due to a greater understanding of their social context. We have collaborated as co-authors on two books about coaching and her writing skills are extraordinary. Again because of her rare ability to recognize patterns, she is able to find the salient practical value from research and present it in a meaningful yet simplified practical manner for the reader. I have personally seen Marilyn's talent in action over the past decade of working together on coaching projects. It is from this vital first hand experience of Marilyn as a coaching partner that gives me the vantage to attest how extraordinary she is as a coach." "Marilyn takes the time to internalize and really learn concepts before applying them. Her natural listening and attending skills make her one of the most qualified individuals I know to be a successful behavioral coach." "Marilyn's 360 interviews helped our team & continue to help me as a leader. If you really want to lead, you're not a leader unless people are following. A real leader knows whether his messages get through, or if unintended messages are coming across. It's well worth the exercise to get real data on how key people perceive my leadership & the future direction of our firm." "I am moved to provide the highest recommendation for Marilyn. Marilyn recently managed a coaching engagement with four very senior executives in a 'Fortune 500' client of mine. She did a wonderful job of managing the work of coaches involved - and coordinating the project. The end result was positive, long-term change in behavior for the client executives - and a very positive experience for the coaches! Along with her great technical job in developing my site, Marilyn has been a pleasure to work with. She has shown the highest integrity and has handled a couple of tough situations in a very professional way." "Marilyn is a master of her trade. She organized and hosted Thought Leader interviews; she created an atmosphere of relaxed excitement and intellectual stimulation which everyone seemed to feel and respond to from the moment they arrived. Marilyn McLeod is an example of pure ability in action." "I recommend Marilyn without question — her interpersonal skills are extremely superior, both in relating to others and managing teams." For over 90 years, The Conference Board has been providing senior executives worldwide with opportunities to share practical business experience with over 120 events a year in all topics of business. Click here to view upcoming schedule. "Marilyn has a wonderful, cheerful personality that makes her a pleasure to work with. She is a thorough professional with skills and talents that are adaptable to many different kinds of projects and organizations." "Thank you for helping us with Peers@Haas. Your contribution to the school has been extraordinary and you are making a real difference in the lives of our students!" "You saw through my static! Thank you, Marilyn!" "There are coaches who will stir up your emotions, give you an assignment and make you feel as if you can accomplish anything, but when the work is in front of you, and the emotion is gone, you wonder where the power you felt went and you feel you are right back where you began. Not with Marilyn McLeod. Marilyn is an excellent business coach, because she listens to you, your vision for your company and then with her expert business knowledge guides you to fruition. She will ask you the important business questions you may not have considered or overlooked because of the variety of actions you must complete. Her guidance, business acumen and insightful information sets you on a path from overwhelm to achievement and growth. Today having a business coach is as important as having a business plan and having the right coach is the difference between cash poor and cash flow. 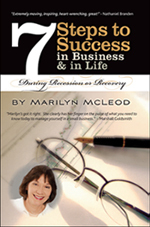 Marilyn McLeod will work with you and assist you in creating a realistic strategy for development and success. You leave Marilyn with greater clarity, tools for executing your plan, a strategy that works and your excitement grows with each step, because you are in a position of empowerment. You are beyond the vision, beyond the dream and into your life." "Marilyn, your Peer Coaching Reference and Peer Coaching Overview are fantastic and I'm recommending that they be added to the Business Coaching Certificate program that I teach at University of Wisconsin Milwaukee. We need a component in the class on peer coaching and it would be perfect to share these documents with the students in these classes." Patricia Clason, Your "Everyday EQ Coach"
"Marilyn, I am so glad I made that first phone call to you. What a treasure you are! Every time we talk I am so excited about the direction my life is taking!" Speaker & Radio Talk Show Host "Positively Monday"
"If you have the chance to hire Marilyn, do yourself a favor and do it! I have worked with Marilyn on several large projects: the gala launch of a new organizational partnership, a hurry-up web conversion project, the re-branding of a website, and the development and organization of a partnership project. I found her technical skills to be superb; whether the question was about how to convert video, how to change a flash movie or how to track response to Google ads, Marilyn knows how. But then, so do a lot of tech consultants. What makes Marilyn so special is that her technical expertise comes bundled with superb interpersonal skills. She can help you think through both the technical and the human part of the problem, then help you implement the solution. Best of all, she's a joy to have around as a colleague. She's not only happy to pitch in and get the job done, she does it with it humor and compassion." "It was obvious in my working with Marilyn over a two year period that she was a wonderful team player. She always brought her kind heart and spirit and willingness to whatever was on the table." "I learned not to forget about what I love doing, and include it as part of my day in order to stay motivated." "Each day is a gift. I try to make each day count. We need to become healers and unifiers, to bring back civil discourse in our civil society." To learn more about the Marshall Goldsmith FeedForward Tool click here. "Thanks for all the support and intelligent challenges to my normal way of doing things. I'm appreciating it!" © 1998-2014 Coach Marilyn. All Rights Reserved.